We are very pleased to be able to remind ourselves and to tell you that we have now been a Fairtrade Village for 10 years. To mark that event we had a little get together in the Old Hall pub on Monday 3 December at 7.oopm. Chris Upton and Rita Verity spoke to mark the occasion and many people came to help us celebrate and brought their ideas for the next 10 years. Many thanks to Ian Palmer for the photograph below. Find more of his photos of the event on the Haworth Village website here. 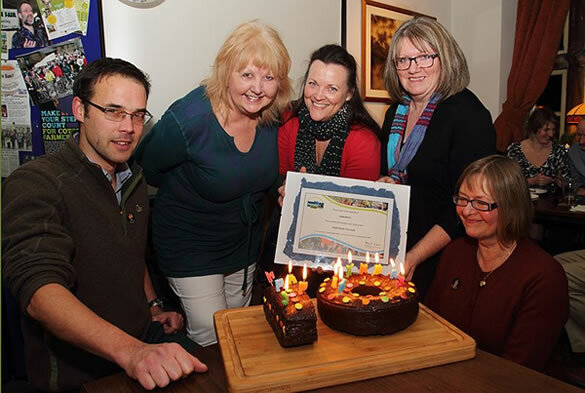 Chris Upton, Rita Verity, Liz Barker, Ann Wiles and Annie Williams celebrate with cake!